February 11 & 12, 2012. Killeen, TX. Great show in a brand new show hall — loved all the extra room and facilities! 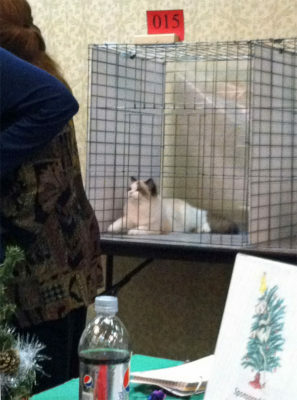 This was the first adult show for Minerva. I am so happy and so proud to announce that she is our newest TICA champion! My sweet 8 month old seal bicolor beauty went up against the first and second best Ragdolls showing in TICA this show season and she still managed to eke out four finals with two of those coming from Best of Breed Ragdoll even with an All Breed cat count of 60. Then when I got home, I realized I hadn’t taken even one picture to memorialize the event. Darn it! Anyway, she looked great and shined like the bright star that is Minerva. Two more finals and Minerva will be a grand champion. I can’t wait to watch her rise to the top. January 27-29, 2012. Portland, OR. I orginally scheduled this show to pick up my new kitten, Victoria, so decided to enter Baby Phat just to see how he did. I knew he was a nice kitten, but since I also knew the kitten count would be 70 I didn’t think much would happen for us. Except Phat did take home three finals against some very heavy competition. I’m so proud of him. Also I had the opportunity to have Phat’s picture taken by the famous Japanese photographer Tetsu. I’m so excited to post his pictures within the next month. January 6-8, 2012. Parsippany, NJ. 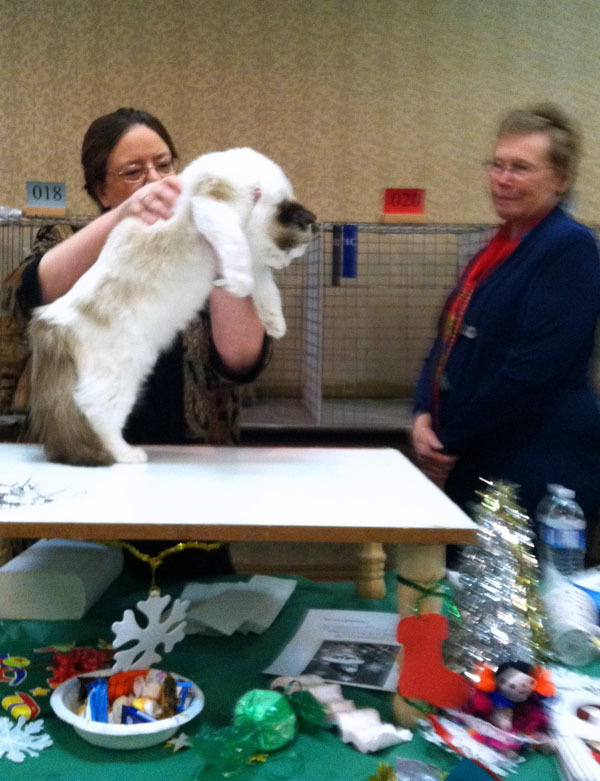 Minerva was Best of Breed Ragdoll Kitten in Show! What a lovely way to start off the New Year. Another three day show in which Minerva had the opportunity to shine. She’s such a good girl. She loves to rock that stage! 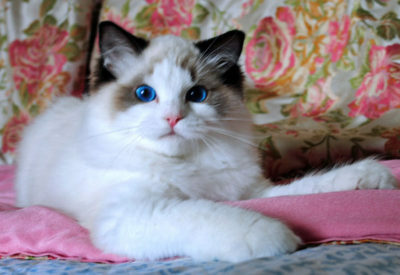 It’s so much fun to have a beauty paegent kitten. I wonder what Eden Wood would think of Minerva? 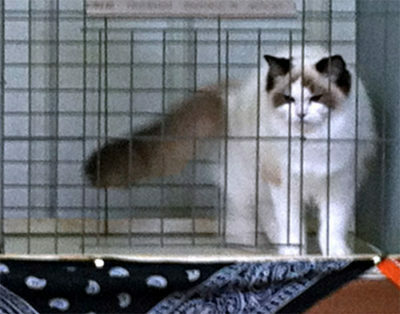 :)The judges love her beautiful type, sparkling deep blue eyes, and exquisite temperament. She literally flops on the table for judging. It’s so cute to watch. Minerva is almost done with her kitten career and I couldn’t be more pleased with her results. December 9-11, 2011. Corpus Christi, TX. 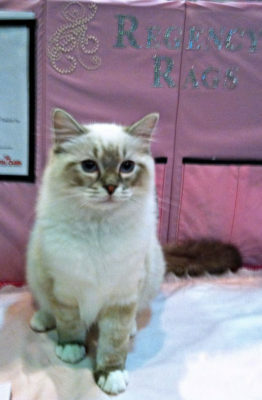 Minerva was Best of Breed Ragdoll Kitten in Show! Another three day show and I am exhausted. So glad to be home with my gorgeous Minerva. We had a great time and Minerva managed to rock that stage one more time! We should have had two more finals but we were dumped in two rings. Looking forward, as always, to our next show where I hope Minerva continues to shine as bright as possible. November 12-13, 2011. Oklahoma City, OK. Minerva came ready to rock that stage and rock it she did. Minerva is such a sweet girl. She’s very polite in the rings giving snuggles and kisses to the judges. 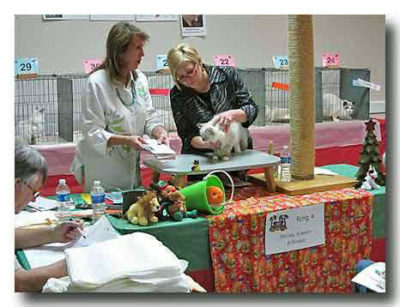 Another show with stiff competition, but Minerva still managed to get past the older six and seven month old kittens to bring home some finals of her own. For a baby five month old kitten this was a great accomplishment for her. October 22 & 23, 2011. Albuquerque, NM. This is one of my very favorite shows of the year. I always have a great time with Ragdoll friends that I typically only see once a year. It’s been a great show for me to bring out a new kitten because the atmoshphere is so conducive of geniality and cameraderie. This year I brought out Minerva. She did fantastic and I’m very proud of this sweet 4 month old kitten. Even with stiff competition she managed to bring in more finals than I anticipated. In fact, I have no pictures of her at the show because I didn’t think she’d do very well. Except one of my friends took a video of her for me, so I’ll introduce that link later on.